Whilst initially advertised as a "Match" target rifle, when introduced in 1955, the BSA Century never entirely lived up to that description. 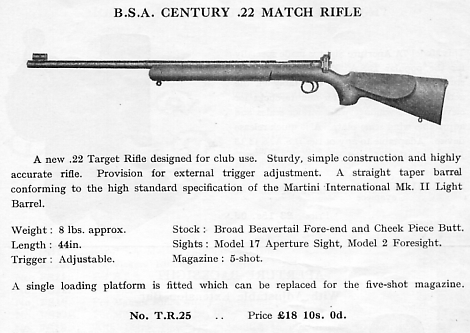 This model was as typically well made and long-lasting as most Birmingham Small Arms Company small-bore rifle production; but it was unable to shrug off its sporting design heritage.The action was based on that of the Supersport Five sporting rifle, and therefore perhaps not quite as capable for target use as other contemporary equipment - the early BSA Martini Internationals in particular; but even a Model 12/15 rifle of 19?? vintage would, in capable hands, almost certainly exceed the performance of the Century. 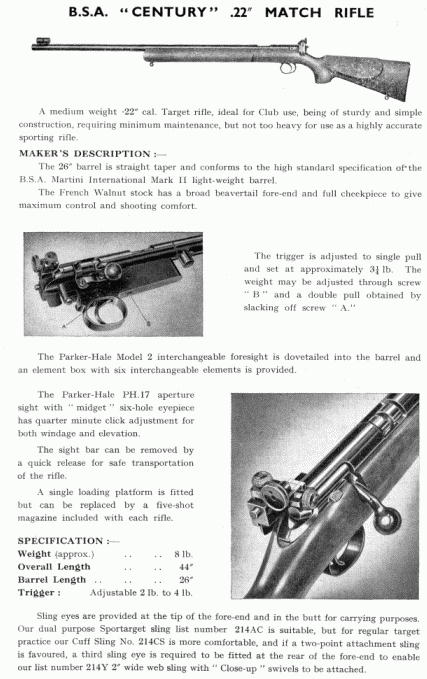 For this reason, whilst the rifle theoretically falls within the Post-Veteran Class of the HARC-MRLWinter Leagues, it would more often than not have been out-shot, and therefore we permitted its use in the earlier date-lined Veteran class, where it was more suitable competition for the BSA Model 12/15s and other earlier "pure" target rifles. The decision has largely been justified by the retention of the better aggregate scores by the likes of the 12/15 in that class. We do not recall a Century excelling in the higher divisions, but one day someone will make one perform exceptionally, if only to disprove our theory! Could that be you? Whilst, still at around £18, the rifle remained relatively inexpensive in its latter years of production, the days of the Century were numbered. The Martini International had appeared in its Mk.II form by now, and the Remington 37 and Winchester 52 rifles were in their heyday - although considerably more expensive - as such American imported rifles inevitably were until the boom of the Sixties long after the 1939-45 War. By the time the Century ceased production in 1961 (all advertising had stopped prior to 1962), even the Finnish Lion and Anschutz Model 54 rifles had come onto the scene. Small wonder that the Century fared so poorly and survived only for such a comparatively short period; by then, economy remained as practically its sole recommendation. Nowadays, examples are to be found that have been fitted with 'scopes, and occasionally with the muzzle threaded for a moderator, probably enjoying latter day use in the field to some effect. It has to be admitted that many others are still being disposed of by small-bore clubs, within whose membership they have spent many years successfully introducing newcomers to target shooting. The action of the Century (shown above) bares comparison with that of the Model 2 and 3 rifles of much earlier design. 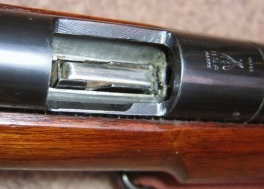 Although the bolt head is now separated from the bolt, and there is a new style of safety catch and no cocking-piece, the bolt handle locking arrangement still owes much to those earlier designs, indeed, even to the War Office 1906 Pattern Miniature Rifle. 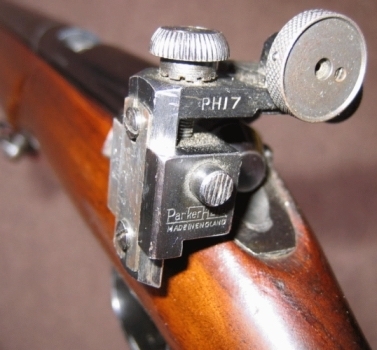 The standard rifle came fitted with the Parker-Hale Model 17 rear aperture sight. This, together with the pistol-grip and wide-forend stocking, were perhaps the main justification for describing the rifle as a Match model; although it can be appreciated that the method of fitting of this sight appears almost as an afterthought in terms of the overall design of the rifle. The stock is an excellent format for the younger or lady shooter, but the barrel and action, apart from a small increase in barrel weight, were still effectively but a progression of previous BSA sporting or dual-purpose designs. The FS22 tunnel foresight was, of course, a straight forward fitment in the barrel's dovetail. Almost any BSA small-bore sporting fore-sight could have been employed here as an alternative. Note that the rifle also came with a sprung single-loading platform (shown below right) for target shooting. This is magazine sized and shaped, and fits in the magazine-well just as the 5 round version. The mere presence of a 5-shot magazine is, in itself, an indication of the sporting ancestry of the iron-work; although the suitability of a repeating option for cadet use cannot be denied. The 5-round magazine was similar, but not identical, to that utilised in the BSA Sportsman range. One difference was that the side-plates each had a pair of raised ribs, rather than the single one pressed into the Sportsman's version. It was this Sportsman box magazine that was modified for use in the BSA Lee-Enfield No.7 training rifle ordered by the Royal Air Force after the War. 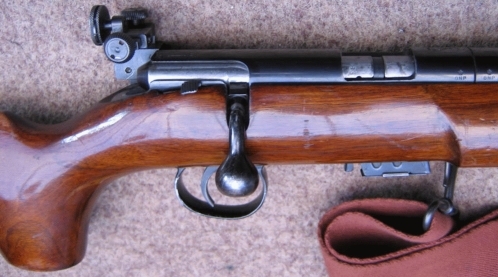 In many ways, the Century could be viewed as an economical alternative to the aforementioned Enfield Rifle No.8, itself intended as a combination target and training rifle for the Services and Combined Cadet Forces. Neither production rifle could truly be described as Match models. A 1958 advertisement was more comprehensive, giving some dimensions.